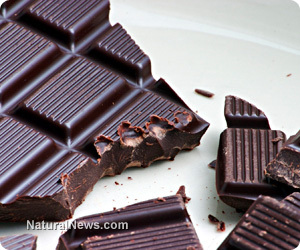 (NaturalNews) Though many think of chocolate as a vice, it should be thought of as a health food. Why? Because chocolate is very high in many essential nutrients, appears to prevent heart disease and stroke, and can even decrease stress. You might not intuitively think so, but chocolate is very rich in minerals. A standard 100 gram dark chocolate bar contains 98 percent of a person's recommended daily value of manganese, 89 percent DV of copper, 67 percent DV of iron, 58 percent DV of Magnesium, 31 percent DV of phosphorous, 22 percent DV of Zinc, 21 percent DV of potassium, and 10 percent DV of selenium. We literally cannot survive without these minerals, and unfortunately many of us who live in modern civilizations are not getting the recommended amount through our diet. Made up of more than just minerals, chocolate also contains the health-promoting compounds caffeine, theobromine, resveratrol, epicatechin, anandamide, tryptophan, phenylethylamine and polyphenol. These compounds are known to increase energy, focus, and positive feelings. The antioxidant content of chocolate is mindboggling too. Chocolate has the highest ORAC score, which is used to measure the antioxidant content of foods, of any commonly eaten whole food. It is estimated to have an ORAC of about 55,000, which is nearly three times that of blackberries, the highest fruit on the list. Antioxidants have been shown to reduce damage to cells and potentially contribute to the prevention of major diseases like cancer, diabetes, and heart disease. So what does the research say about chocolate preventing disease? One study of 470 elderly men over a 15-year period found that the men who consumed the most chocolate were 50 percent less likely to die of a heart attack than the men who consumed the least chocolate. Another study of almost 5,000 men and women found that those who ate chocolate at least five times a week were 57 percent less likely to be diagnosed with heart disease. Heart disease isn't the only thing that appears to decrease with chocolate consumption. A study of more than 30,000 women between the ages of 49 and 83 found that the more chocolate the women ate, the less likely they were to suffer a stroke. The women were followed a full decade, and the lowest chocolate eaters had stroke rates of 7.8/1000 while the highest chocolate eaters had stroke rates of 2.5/1000. Chocolate may even be able to decrease stress, something that many of us could use in our current fast paced world. Researchers gave study participants 40 grams (a bit less than half of a standard bar) of dark chocolate every day for two weeks. Blood levels of cortisol and catecholamines were measured at the beginning and end of the study, and perhaps unsurprisingly they were found to be markedly decreased after the two weeks of chocolate consumption. So next time someone questions your chocolate habit, tell them it's for your health. Of course, dark chocolate has a much higher cacao content and lower sugar levels, so go for the dark stuff if you can. If you don't like 90 percent cacao chocolate bars, start with something lower like a 50% cacao bar. Your taste buds will eventually adjust to a less sugary flavor, so you can enjoy the health benefits of dark chocolate while also enjoying the taste.